Dimitrios Papadimoulis is a Greek MEP who represents the Syriza party in the European Parliament. He has spent a life time involved in left wing political activism in his native Greece and has been a member of the Syriza central leadership which brought the party from opposition into government in 2015, while the country was still in the midst of its financial and economic crisis and subjected to extreme political and economic pressure by the European Union (EU) establishment. 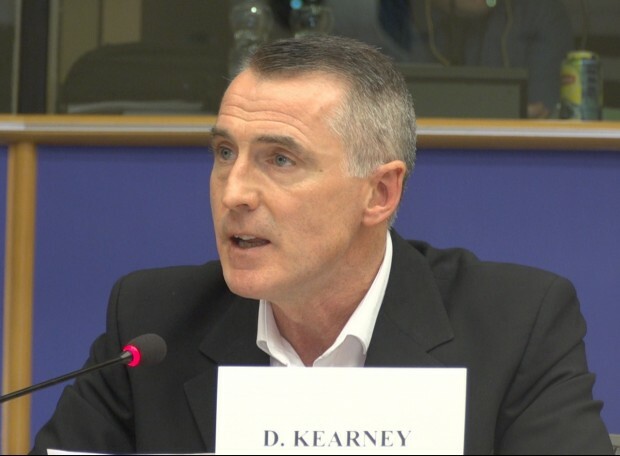 Dimitrios is ‘laconic and philosophical in the way of Sparta’ – to borrow a phrase he used during a contribution at a recent conference which we attended together in Brussels, organised by GUE-NGL; the European Parliamentary group to which both Sinn Féin and Syriza are affiliated. This meeting brought together leadership representatives and MEPs from twenty of the most significant political parties on the progressive Left in the EU to discuss the future direction of GUE-NGL and future political strategy and co-operation among left wing and progressive parties; including the 2019 European elections, and the next term of the EU parliament. During one of our conversations at the conference Dimitrios recalled a story from 25-30 years previously, when he was travelling to deliver a speech. Dimitrios told his taxi driver what he was planning to say at the meeting. Dimitrios immediately decided to change his speech. He learned a lesson that day from the taxi driver which has stayed with him ever since. Theories or notions, and even visions for change (however laudable) remain just that unless they can translate into concrete change in society. People want change which makes a material difference in their lives; for them and their families. Fair wages; high quality education and health services free at the point of delivery; and a clean sustainable environment should not be dreams. They need to become realities. So political activists who are committed to transformational change need to be grounded in the real world. They have to understand what they can deliver in the here and now, and then to have a plan to achieve even more. But the progressive Left can only make change when it has the strength to do so. That means setting realistic objectives and priorities, and then devising strategies which work. I said in my opening comments to the conference that Europe is at a crossroads. The political direction, policy orientation, and increasing need for reform of the EU coupled with, and often fuelling the rise of the extreme right wing, now presents an existential threat to the principles of the progressive Left. Social democracy has effectively collapsed both politically and electorally across Europe. · That racism, sectarianism, misogyny, homophobia and xenophobia are opposed. These ideas should be a common platform for expanding the political strength of the progressive Left. However, that potential faces many challenges. Some of these are beyond the control of the progressive Left, but others are not. All of this was under discussion at the GUE-NGL conference. There were many notable contributions. 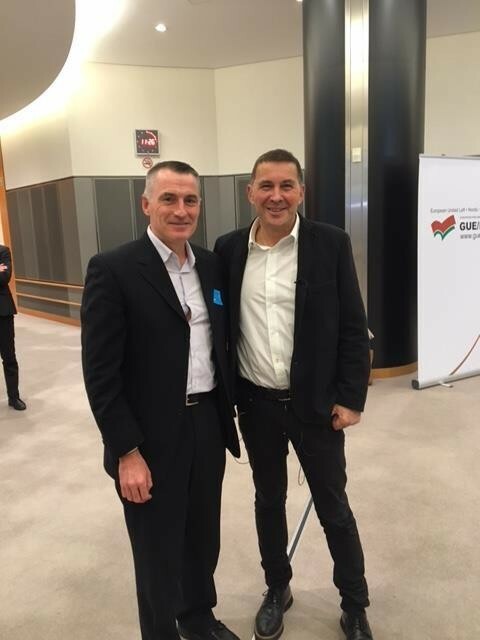 Arnaldo Otegi, the General Secretary of the EH Bildu was in attendance. He had just received the ground breaking judgement from the European Court of Human Rights, which ruled his prosecution was wrong. During Arnaldo's presentation he provided a powerful critique of global capitalism and the importance of defending community and social values. Panos Skourletis has been a senior minister of the Syriza government. In a highly significant move several months ago, he moved from that role to take up the position of Secretary of Syriza's Central Committee. Panos set out an analysis of the situation in Greece and wider Europe and argued that it is time for a common front of left parties and other progressives and democratic forces in Europe. Earlier I argued that unity and cohesion are essential between parties and democratic forces on the left in Europe: and that we must focus on what expands unity, whilst respecting our differences and uniqueness as parties and national movements. 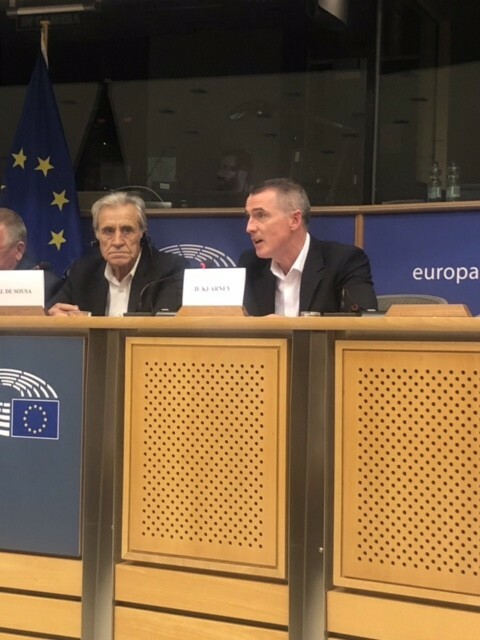 Sinn Féin believes that GUE-NGL has successfully enabled progressive parties from the left to co-operate within the European Parliament, whilst recognising the autonomy of political delegations. This is one of GUE-NGL’s strengths as a parliamentary group and deserves to be consolidated. Unanimity is not required on all issues, all of the time; but progressives cannot afford to be disunited. Political sectarianism undermines political strength, solidarity and fraternity on the progressive Left. The collective strength of the progressive Left in Europe stems from the domestic relevance and political strength of its constituent parts. The left will only be as strong in the European Parliament as progressive Left and republican parties are relevant and strong in their national contexts. The success of a real progressive Left alternative, depends upon securing strategic beach heads of political strength and influence. This is why support for Europe's only left wing government in Greece is so politically important. Whilst progressives need to be in a hurry to make change and in pursuit of a social and more democratic Europe, we also need to be realistic and pragmatic. The distinction between strategy and tactical positions need to be understood. Alliances with others are indispensable to the process of changing the overall balance of forces. Rigid or dogmatic ideological positions can prevent agreement upon shared objectives and securing unity among the widest cross section of progressive and democratic opinion. The political discussion and focus upon an emergent European 'Progressive Caucus' embracing the Left, social democrats, and environmentalists is such an innovative and welcome initiative. I proposed to the Brussels conference that a strategic consensus among the progressive Left and others should be based upon support for national independence, social emancipation, citizen's rights, and democratic control over the economy. For our part Sinn Féin will contest the European election in 2019 on an agenda which advocates for the creation of a Social Europe. We will be emphasising the need to protect rural and fishing communities; the promotion of economic democracy; enhanced environmental policy, human rights and social justice; as well as defence of the Irish peace process and support for a united Ireland. The onset of Brexit has changed the political and social landscape in Ireland, and also significantly influenced political discourse within the EU itself. It has swept away all of the established constitutional, political and economic assumptions about the status quo in Ireland; and refocused international attention upon the democratic case for Irish unity. During the conference I highlighted the denial of citizens' rights and blocking of political democracy in the north of Ireland by the DUP and British Tory government. The point was made that this existential rights crisis, combined with the imposition of Brexit represented the most serious threat to the Good Friday Agreement, and the democratic option for managing change in the north of Ireland. The European Parliament & EU institutions have become strategically important forums within which to promote the democratic aim of a united Ireland and to encourage support for an Irish unity referendum. The level of interest in, and support for constitutional change in Ireland is now at an unprecedented high level across the EU. 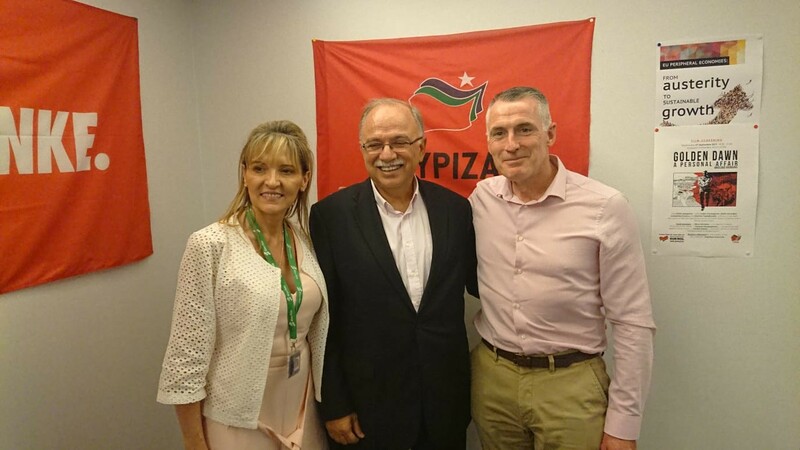 Sinn Féin will continue lobbying to make the case for a united Ireland a priority for the progressive Left and within other sections of democratic opinion represented in the European Parliament. Irish unity is integral to the vision of a new Europe. Going forward, the progressive Left in Europe needs to focus its collective efforts upon maximising representation and influence in the next parliament. GUE-NGL has to expand as an inclusive, welcoming group, providing a voice for progressive change. It should act as a catalyst for new alliances with other democratic and progressive groups in the next parliament term which support the need to democratise and reform the EU; support workers' rights; defend the environment; oppose bigotry and discrimination; and champion international solidarity and peace. That is what the shared ambition of a New Europe should mean. Sinn Féin has a central role in promoting that vision. The progressive Left across Europe has much to do. We need to be people in a hurry. To build a New Europe - a Europe of Equals.